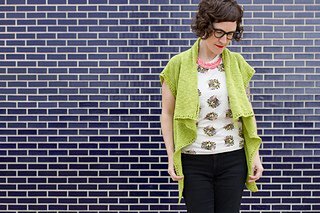 Yarn: 4, 4, 5, 5, 6, 6, balls zooey, dk weight This open cardigan with wide short sleeves is a breezy layer for warmer weather. The front edges drape down, then float away from the body; eyelet edgings keep the loosely knit fabric from curling. Because it is worked sideways, this pattern is highly adjustable! To increase back width, simply knit the back section until it reaches desired width. To increase armhole size, bind off/cast on additional stitches for the armhole openings.